Two Toned Lipstick: Two-toned lips are not that much new in the beauty world. In the ’90s, when ladies used to use too much brown to their lips, there was the trend to line the lips with darker color lip liners and filling lips with another tamed down the shade. Recently the multi-tonal lip looks are back in trend again. But, this time people’s imagination is not being limited to the ombre lips only; we are often seeing completely distinctive two-toned lips among celebrities these days. Today I am presenting break-downs of 2 varieties of Two-toned lips. My first look will be a re-creation of one of Kareena Kapoor’s Lakme advertorial lip looks and the second one is inspired by a multi-tonal lip look by celebrity makeup artist Arshis Javeri. Both of these looks are easy to do and quite customizable. I needed less than five minutes to complete each of these looks. That is why I named them as ‘Super-Quick’! With everything being said, let’s move on to the tutorial. 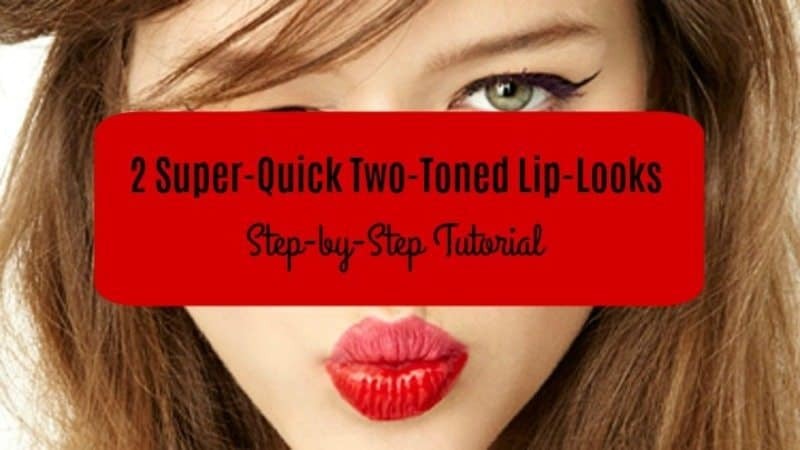 The main theme of Distinctive Two-toned Lips is to use separate lip colors for upper and lower lips. The idea is quite contrary to the general concept of lip makeup where we use one color to fill both upper and lower lips. If both the lip colors are from the same color family (for example, one light pink and one dark pink) the look becomes muted whereas two utterly different bold colors can make them look pretty eye-catcher. The color selection is the key to control the contrast for this lip look; the rest is quite simple. Anyone who knows the basics of lip lining and filling can nail down the look like a pro. That is the reason this book caught my eye. Here are the steps I follow if I am opting for this look. Choose two different lip colors preferably from different color families. 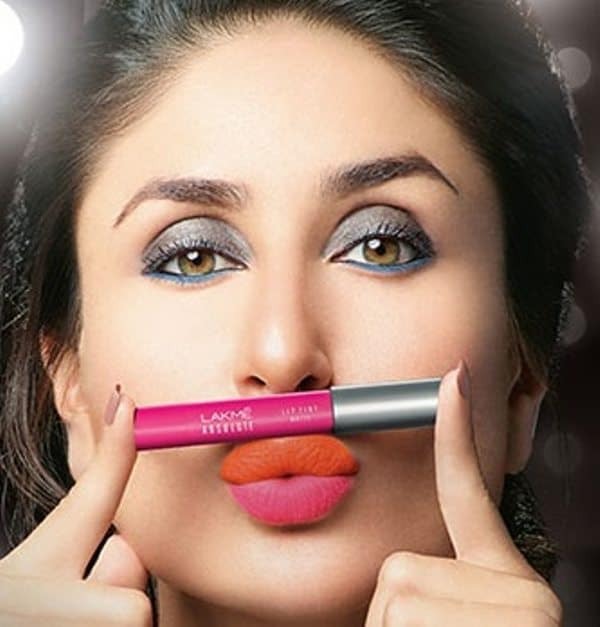 Since I am recreating Kareena’s look I have selected a bright orange and a blue toned pink shade. Line the lips with the chosen lip colors as I have done; this will make the lips look fuller. Fill the lips and voila! Your look is complete! 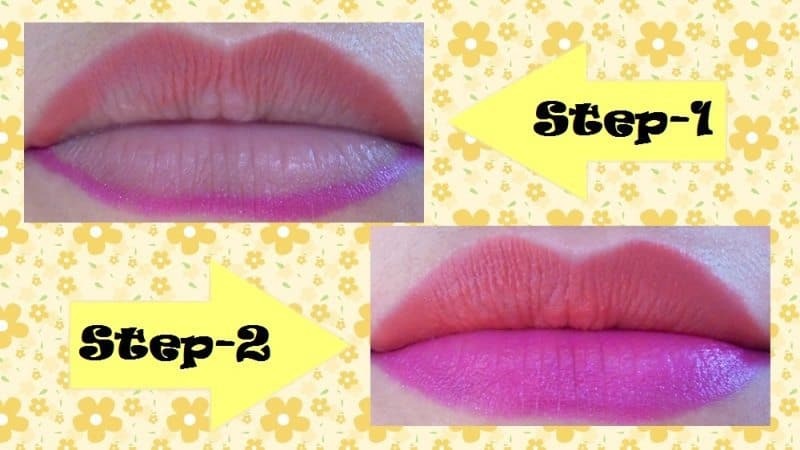 In this lip look, our focus is to divide the upper and lower lips into inner and outer sections and assigning different colors to each section. Then, the colors in the middle region are blended in such a way that the difference between the colors is still identifiable. 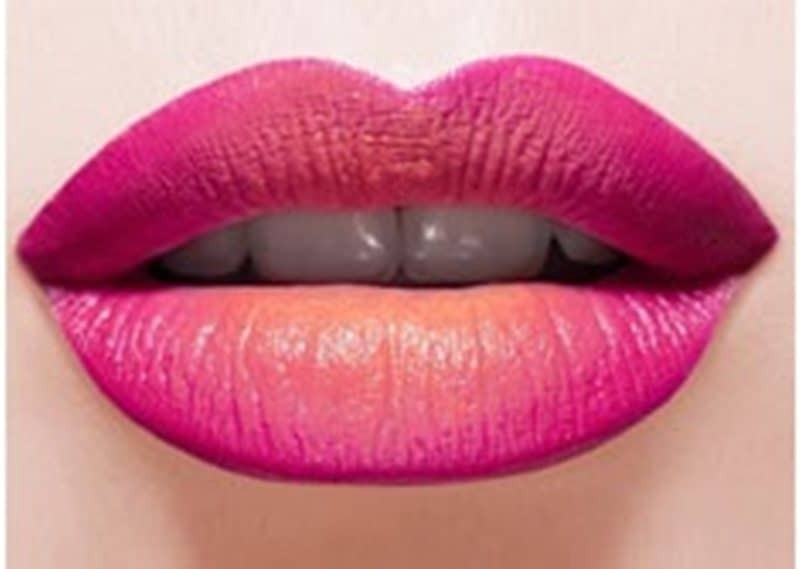 This lip look follows the rules of ombre lips but, here the colors come from different color families. Like the first look, the boldness of the lips depends on the amount of contrast between your chosen color. If you use a yellow toned red with a cool toned pink, the look will get really bold while a color selection like mine will produce a toned-down daytime lip look. The steps I find convenient are listed here. For this look, we will need two lip shades again. I am keeping this look muted so, I have chosen mauve and a light peach shade. Roughly draw a thick line around the lips with one of those shades. I am using the mauve one for lining my lips. Apply the other shade on the inner area of the lips. Blur the harsh edges where both the shades meet. I have used my finger for blending in this look but, lip brushes can also be used. Bridal Makeup Trends in 2017 – for the Savy Bride! is there anyway you could talk more about lipsticks ? im waiting for moreeeee too ? like that. Can I take a portion of your post to my blog?